an abnormality of development; in pathology, alteration in size, shape, and organization of adult cells. See also dysgenesis. adj., adj dysplas´tic. bronchopulmonary dysplasia chronic lung disease of premature infants with hyaline membrane disease who have needed high concentrations of oxygen and assisted ventilation. Factors related to its development include alveolar damage due to hyaline membrane disease, oxygen toxicity, positive pressure ventilation, and endotracheal intubation. Treatment includes supportive measures and oxygen therapy. Recovery and normal pulmonary function usually occur by the age of 6 months to 1 year; however, some infants may exhibit limited tolerance to exercise. craniometaphyseal dysplasia metaphyseal dysplasia associated with overgrowth of the head bones, leonine facies, and increased distance between the eyes. Craniometaphyseal dysplasia. 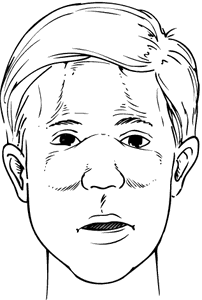 From Dorland's, 2000.
cretinoid dysplasia a developmental abnormality characteristic of cretinism, consisting of retarded ossification and smallness of the internal and reproductive organs. cystic renal dysplasia renal dysplasia in which there are cysts. developmental dysplasia of the hip (DDH) instability of the hip joint leading to dislocation in the neonatal period. Although it may be associated with various neuromuscular disorders, such as myelodysplasia, or occur in utero, it most commonly occurs in neurologically normal infants and is multifactorial in origin. Usually there is laxity of the hip ligaments. Most affected infants are first-born children and 30 to 50 per cent present in the breech position. About 90 per cent of those affected are girls. The condition was formerly called congenital dislocation of the hip, but because the dislocation is not normally present at birth but develops later, the term developmental dysplasia of the hip is preferred. ectodermal dysplasia any of a group of hereditary disorders involving absence or deficiency of tissues and structures derived from the embryonic ectoderm, such as teeth, hair, nails, and certain glands. fibromuscular dysplasia dysplasia with fibrosis of the muscular layer of an artery wall, with collagen deposition and hyperplasia of smooth muscle, causing stenosis and hypertension. It most commonly occurs in the renal arteries and is a major cause of renovascular hypertension. fibrous dysplasia of bone thinning of the cortex of bone and replacement of bone marrow by gritty fibrous tissue containing bony spicules, causing pain, disability, and gradually increasing deformity; it may affect a single bone (monostotic fibrous dysplasia) or several or many bones (polyostotic fibrous dysplasia). When associated with melanotic pigmentation of the skin and endocrine disorders, it is known as albright's syndrome. metaphyseal dysplasia a disturbance in enchondral bone growth, failure of modeling causing the ends of the shafts to remain larger than normal in circumference. oculodentodigital dysplasia a rare hereditary condition, characterized by bilateral microphthalmos, abnormally small nose with anteverted nostrils, hypotrichosis, dental anomalies, camptodactyly, syndactyly, and missing phalanges of the toes. renal dysplasia a congenital disorder of the kidney, with persistence of cartilage, undifferentiated mensenchyme, and immature collecting tubules, as well as with abnormal lobar organization and nearly always cysts; it may be unilateral or bilateral and total or subtotal. Total bilateral dysplasia is rapidly fatal in the neonatal period, while milder disease may be asymptomatic. retinal dysplasia a general term for a congenital defect resulting from the abnormal growth and differentiation of a retina that fails to develop into functioning tissue. 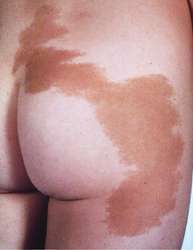 a disorder characterized by fibrous dysplasia of bone, isolated brown macules on the skin, and endocrine dysfunction. It causes precocious puberty in girls but not in boys. The bone lesions are reddish gray, gritty fibromas containing areas of coarse fiber that may be confined to one bone or that occur in several areas, frequently causing deformities, pain, and pathological fractures. Treatment may involve osteotomy, curettage, and bone grafts. Also called Albright-McCune-Sternberg syndrome, osteitis fibrosa disseminata.